We have found that many of our customers have enjoyed not only the experience of training their own dog, but have an improved relationship with their canine companion and want to advance their dog’s capability. 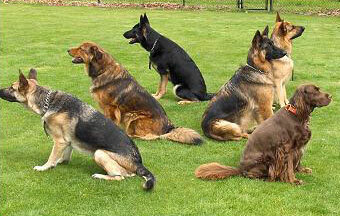 Our advanced obedience program consists of five private lessons one lesson per week. Our objective is for you to not have to rely on your dog’s leash. Group training classes are normally held twice a month. (please see calendar for days and times). These classes are for those of you who have completed our private formal obedience course. You have worked hard to get to this stage of your training. You can expect you and your dog to be in a class size of around 15 to 30 alumni graduates of Canyon Crest. This class gives the dog and owner a stimulating environment and allows for personal contact with the instructors. It is in your best interest to take advantage of this quality time to be spent with your dog twice a month. Our group class will give you proven results that you can continue to use throughout the rest of your dog’s life. Once you complete the 10 private lessons you can participate in our group classes that are generally held twice a month on Saturday mornings. One group class is included with our training course and after that there is a small charge of $20.00 per group class. We invite visitors to come and observe. You do not need to make an appointment to observe this class, just show up. Please leave your dog at home for this visit. Class will not be held on holiday weekends! Did you enjoy hide and seek as a kid? How would you like to have someone hide and you can tell your dog to go find them? Whether you are wanting to get involved in search and rescue, police dog tracking, finding lost items or you just want to have a fun hobby with your dog; this program will give you the knowledge to have your very own tracking program.